A river closure will be in force between the Gateshead Millennium Bridge and the Swing bridge on Saturday 4th August 2012 from 21:15 – 22:30. The event scheduled to commence at 21:30 will involve low level pyrotechnics fired from Gateshead quayside and artists performance on two vessels between the Gateshead Millennium Bridge and the Swing bridge. Only vessels involved in the event will be allowed to approach the area, other vessels should keep well clear and be prepared to follow the reasonable instructions of the Port of Tyne Launch which will be present throughout the event and maintaining a listening watch on VHF Ch11 & 12. Further information may be obtained by contacting Tyne VTS on (0191) 257 2080. This entry was posted in General Interest and tagged Bridges Festival, Port of Tyne on July 31, 2012 by Iain Forrest. 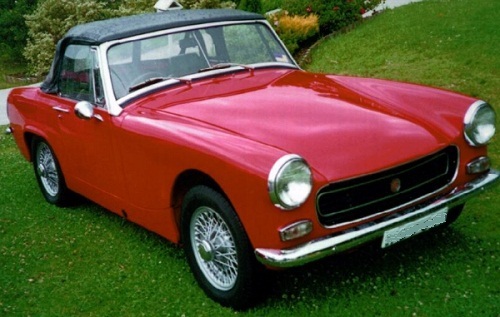 Sales of Fertan rust converter are rarely fast moving, however a North East based member of the MG Midget club has been buying our stocks up! He read in the MG owners magazine about the fact that it was an excellent product for ‘fighting’ rust & had been used with success by a number of the members, he purchased the 500ml size to do a little remedial work on his classic Midget, got home & then decided to try it out on his Transit van, was so impressed he was used the whole container up! Has now ordered some more for more remedial work on the Transit & of course for use on the sports car! Fertan rust converter destroys rust & protects steel, it is a complex patented tannic acid product, offering exceptional protection against rust & is not toxic! It converts loose rust to powder which can be washed off leaving a stable & inert surface, rust is eliminated & any new formation prevented. This entry was posted in General Interest, Tips and Advice and tagged Fertan, Rust Convertor, Rust treatment on July 31, 2012 by Iain Forrest. Last year when the Euro was in crisis we held a fund raiser for the local branch of the RNLI, Paul & Rachel Chandler were the speakers & what a superb job they did. However before the event took place & without any prompting those very nice guys at Jotron (once they had learned of the event) offered one of their new EPIRBs as a prize in the raffle, the evening went well; loads of money was raised & Paul Common the lucky winner of the Jotron 60 GPS GMDSS EPIRB went away with an empty Jotron box! Why, cos the new model was not due out till the middle of this year! 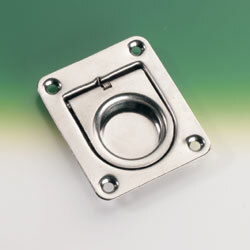 Well we are still in the Euro crisis however the good news is that the Jotron 60 is now available in quantity. I must say that Paul looks delighted at receiving this superb bit of kit, not sure about the expression on Andy's face, perhaps it's the thought that he would rather be selling than 'giving' one away! This entry was posted in New Products and tagged Epirb, Jotron on July 31, 2012 by Iain Forrest. You just 'get rid' of one delivery driver & then another comes along! Poor 'old' Rob had just unloaded (with a little help from other members of staff) over two tons of high quality calibrated mooring chain & tested shackles, then along comes another truck with 20 Hanssen Offshore flare kits & 5 inshore kits, all destined for the local fishermen. Tucked away in the consignment was also 20 inshore first aid kits, 20 Fireblitz dry powder fire extinguishers & 20 Icom M23 hand held VHFs. Just as he started to 'clear' the safety equipment away a third wagon turned up with a batch of Yamaha engines to be unloaded! This entry was posted in General Interest, Safety and tagged Chain, Fire Extinguisher, First Aid Kit, Flares, Handheld VHF, Outboard, Yamaha on July 31, 2012 by Iain Forrest. Inflatable dinghy: PVC or Hypalon - how do you tell? 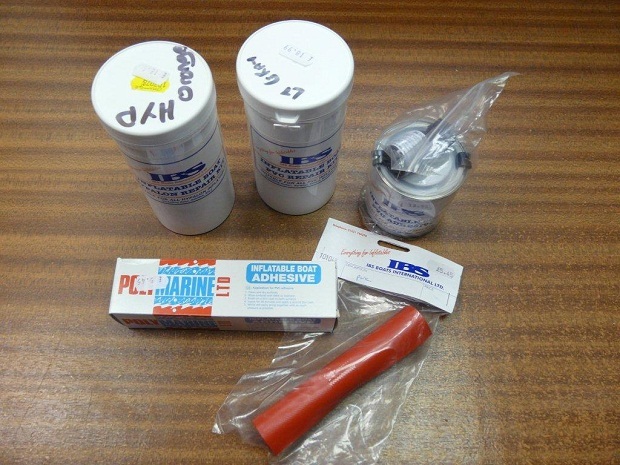 Before making a repair or adding an accessory to your dinghy you need to know what material it is. How can you tell? Quite easily and there are two methods........ first one is to get a small quantity of Acetone & moisten a piece of cloth then rub it over the surface. If it's PVC the surface will become sticky; if Hypalon there will be no reaction. 1st Tip to observe, do the test in an ‘out of the way place’ 2nd tip: Cheap nail varnish remover is usually acetone or similar. The other method is to unscrew a valve. If the fabric is the same colour inside as outside it will be PVC, if Hypalon it will be a much darker on the inside. We do stock Acetone, Hypalon & PVC repair kits, material & adhesive and of course sell replacement inflatables should yours be damaged beyond repair. 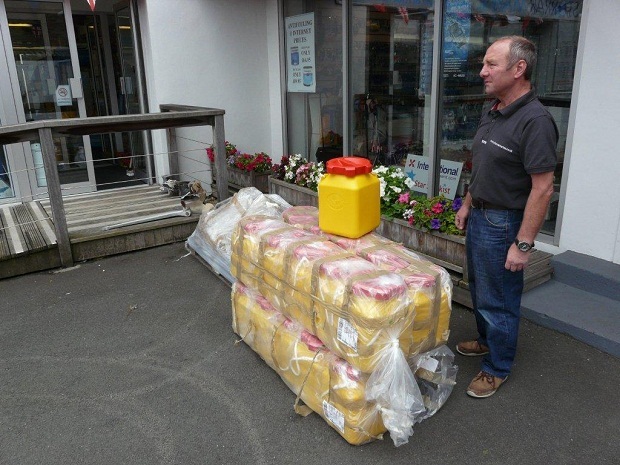 This entry was posted in General Interest, Tips and Advice and tagged Acetone, Adhesives, Hypalon, Inflatable dinghies, Inflatable dinghy, Inflatables, PVC, Repair Kits on July 31, 2012 by Iain Forrest. Believe it or not, the poor weather of the last few weeks has helped sell certain items in the chandlery, foul weather gear, waterproof breathable socks, fabric proofers etc. 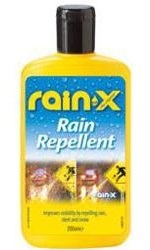 One of the best sellers during the damp days has been Rain-x rain repellent which has seen a tremendous surge in sales! Rain-x (the invisible windscreen wiper) improves visibility by repelling rain, sleet & spray (thankfully no sleet, but we did have hail the other day) Customers eager to purchase Rain-x who are flocking thru our chandlery door include motor cyclists - brilliant for spray visors, one of the skippers of the pilot launch - keeps cabin windows that have not been fitted with windscreen wipers clear, commercial crane operators likewise, the list of satisfied users just keeps growing! This entry was posted in New Products and tagged Grangers, RAIN-X, Renovo, Sealskinz on July 19, 2012 by Iain Forrest. Our sail loft has just made up a little canopy for a guy who wants 'a little bit of protection from the elements' (I cannot imagine why) when out on the water. He collected the boat today & as he was so delighted with Norma's workmanship, we have told him if he has a few spare fresh mackerel next time he is out to lob them her way! Whilst he was in the chandlery he also purchased a portable fishfinder from Lowrance, however if the mackerel are running that will be the last thing he needs! Incidentally the RYA have some excellent books out on fishing including G72 Fishing Afloat, G88 Pocket guide to Fishing Knots, G90 Pocket Guide to Sea Fishing Rigs, G91 Pocket Guide to Sea Fishing Baits & to prepare you for a (fishing) life on the ocean wave, G50 Seamanship For Sea Anglers. Two other books on this subject are Cruiser's handbook of Fishing by Scott & Wendy Bannerot & Sea Fishing by Jim Whippy. This entry was posted in General Interest and tagged Canopy, Fishing, Lowrance, RYA Books, Sail Loft, Sea Fishing on July 18, 2012 by Iain Forrest. FEARSOMELY FERAL DOGS OF WAR! 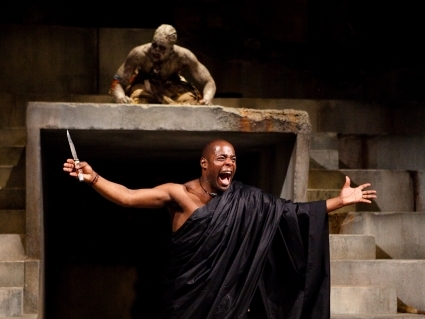 That is the verdict of a critic from the Mail Online who reviewed the Royal Shakespeare production of ‘Julius Caesar’ which opens at the Theatre Royal Newcastle upon Tyne on the 19th of July & runs thru to the 28th, you may wonder where we fit in? Well today we supplied to the theatre some flush fitting hatch handles, their eventual destination..... to be sunk into the floor of the stage to take the guy ropes of a tent! When the artistic director of the RSC rang, we could tell him that we had five different styles in stock, some round, some square & sourced from EC Smith, Aquafax & Plastimo. This entry was posted in General Interest and tagged Aquafax, EC Smith, Lifting Ring, Plastimo on July 18, 2012 by Iain Forrest. 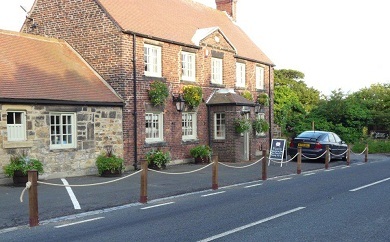 When Nicholsons of Whitley Bay (my parents' & our family butcher) were delivering meat to the newly refurbished Beehive Inn near Seaton Delaval one of the partners in the venture noticed the driver was wearing an RNLI crew member top - Doug Nicholson who was doing the delivery & maybe having a sneaky pint? 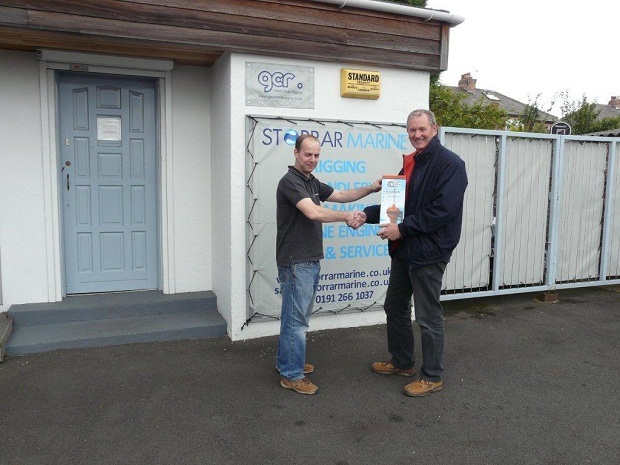 Being a 'seafarer' he was asked where he thought he could get some traditional but synthetic rope that would prevent customers leaving thru the front door of the pub & perhaps straying on the road, 'Storrar's on the Coast Road or google www.marinechandlery.com' was the answer he gave. 30mtrs of 24mm synthetic hemp was purchased and I think it looks the ticket. Speaking of Beehives, we also sell Beeswax in retail blocks, sell waxed whipping twine & of course most sail repair kits contain beeswax & don't forget, our mosquito nets are perfect from keeping insects, including bees out of your boat! This entry was posted in General Interest and tagged Beeswax, Mosquito Nets, Rope, Sail Repair Kit, Synthetic Hemp, Whipping Twine on July 17, 2012 by Iain Forrest. 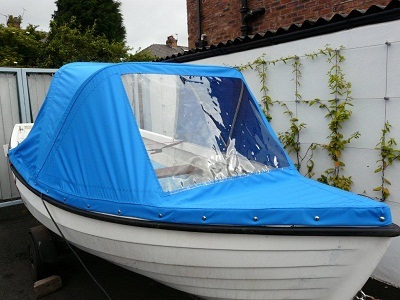 The poor weather recently has presented a challenge to those of us who need to repair or modify their craft in the wet conditions we have been experiencing this ‘summer’! Earlier this week a rather bedraggled owner of a thirty two footer came into the chandlery, had managed to ‘bounce’ of the fuel berth at the local marina & with the weather we have been having was worried about getting a dry day to do a temporary repair. Fortunately these days we do have more than one product to offer. For a simple 'dint filling' exercise we often sell ‘Magic Bond’ epoxy putty, can be used on fibre-glass, epoxy, metal, wood and most importantly even underwater! For structural repairs we use West System's G/Flex epoxy which produces a reliable long term bond in damp or wet situations. Great also for difficult to repair materials like those used in the manufacture of plastic canoes & kayak’s, or for the repair of alloy boats where welding is not an option. There is an excellent little demo on U tube which shows you how it is done & another on plastic kayak repair. By the way, if you read our article 'Introduction to Sealants and Adhesives', you would already know - never use silicone on Aluminium! This entry was posted in Tips and Advice and tagged Devcon, G/Flex, Magic Bond, West System on July 13, 2012 by Iain Forrest.